Not necessarily because of the number of stocks involved – Ireland’s one of the few developed markets where it’s entirely possible to roll up your sleeves & get to know each stock pretty well. [I count 70 stocks in my latest file]. That may or may not float your boat, but I think it’s another good reason to put the Irish market on your to-do list this year. Picking out 2 or 3 safe & cheap stocks is a real luxury – it’s infinitely more challenging to tag every single stock with a bull or bear call (let alone a price target! ), and to then up the stakes with an aggressive weighting on each stock holding. I’m delighted to see this level of out-performance across the board! On average, it amounted to an incremental 6.7% return vs. the index. Which turns out to be quite a bit lower than the average 11.8% incremental return we observed at end-Q3. But that makes perfect sense – the market had turned emphatically ‘risk on‘ as we entered Q4. So much so, many of the hot/junk stocks enjoyed significant rallies. Many of these, not surprisingly, were missing from the Beta Portfolios, or were in fact (possibly aggressive) shorts in the Alpha Portfolios – which led to a strong catch-up from the benchmark. In the end, on average, the Beta Portfolios won out over the Alpha Portfolios, which is to be expected in a strong market. But it was certainly a close call..! The character & depth of the Irish market really doesn’t permit the creation of a true Alpha Portfolio – as in a market-neutral long/short fund. What I created was far less market-neutral, and far more of a stock pickers portfolio – basically, long value/GARP stocks & short the dross. 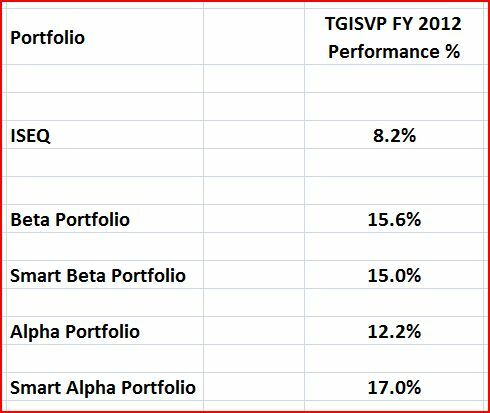 Perhaps more volatile, but it seemed an eminently sensible & attractive approach to take – so I was delighted to see my 2012 favourite, the Smart Alpha Portfolio, actually clocked the best performance. By far – it managed +17.0%, an 8.8% out-performance! This is only a year-long live experiment at this point, but it certainly suggests a sensible value-based approach to investing in a particular market (or sector) may well offer attractive excess returns. [I leave it to somebody else to prove up a growth approach]. It’s probably also the best way to side-step and/or resist the lures of some of the usual stock disasters each year. Of course, only time will really tell – we need a much longer time-scale to determine whether 2012’s outcome is truly flagging up a sustainable performance edge. So, shall we continue with this TGISVP experiment in 2013..?! Beta Portfolio: We assume an investor goes equally long all 36 stocks with positive Upside Potential (e.g. invests EUR 1 in each stock, for a total of EUR 36). The 39 other stocks, identified as neutral (2) or over-valued (37), are ignored. Gain/Loss% on each stock’s measured from the share price at the time of valuation/publication to end-2012. The portfolio return contribution for each stock’s simply its Gain/Loss%/36. happy new year. Chapeau for this whole exercise! Thks, Massimo – I look forward to talking more in 2013 – you may like my next post..! Hey Wexboy, I hope you are well. what european websites do you follow. are you familiar with any newsletters that are geared to euro equities.and do you know any people on twitter who follow euro stocks. liam. Take a look at the Blogroll on the left – there a few European sites I visit regularly. For overall continental coverage, I guess http://valueandopportunity.com/ is your only man! You might want to also check out http://eurosharelab.com/ but note it’s a paid website.